Glottal incompetence is a condition of weakened voice production. The incompetence derives from loss of air through the vocal folds during phonation. Affected patients often report a weak breathy voice, decreased loudness, vocal fatigue, inability to produce an adequate cough, and shortness of breath while talking. Transcutaneous injection laryngoplasty is a treatment option that aims to improve glottal incompetence by moving one or both of a patient's vocal folds toward the midline, reducing the loss of air and thereby improving the symptoms. Augmentation material, which is a gel-like filler, is injected transcutaneously through the anterolateral neck directly into the vocal fold(s). Transcutaneous injection laryngoplasty is an office-based procedure that allows immediate reduction of symptoms. The procedure requires only local anesthesia with no need for an intravenous line or monitoring of vital signs. Two people are required to perform the procedure. An assistant passes the nasopharyngoscope through the patient's nasal passage and suspends it above the larynx so that the surgeon can view the inside of the throat. The surgeon then passes a needle connected to a syringe filled with augmentation material transcutaneously into the vocal fold. Injectate is then deposited into the vocal fold. See the Technique section below for more specific details. The vocal folds, also known as vocal cords, are located within the larynx (also colloquially known as the voice box) at the top of the trachea. They are open during inhalation and come together to close during swallowing and phonation. When closed, the vocal folds may vibrate and modulate the expelled airflow from the lungs to produce speech and singing. For more information about the relevant anatomy, see Vocal Cord and Voice Box Anatomy and Larynx Anatomy. Injection laryngoplasty is a treatment for glottal incompetence. Depending on the injectate used, the vocal fold can be medialized for weeks to years. No absolute contraindications prevent a patient from being a candidate for vocal fold injection. Individuals may have an allergic reaction to a specific injection product. This prevents them from being an injected with a particular product but does not preclude them from vocal fold injections in general. If the etiology of a patient's glottal incompetence is an irreversible cause (eg, severed recurrent laryngeal nerve), the patient may be better served by a permanent procedure such as thyroplasty. Relative contraindications include a patient who is anxious, unable to cooperate, or taking multiple anticoagulants. Three sites are anesthetized for transcutaneous injection laryngoplasty: the nasal passage, the larynx, and the skin overlying the injection site. To anesthetize the nasal cavity, an atomized solution of 4% lidocaine and 1% oxymetazoline is sprayed into the nasal passage. Pledgets with the same solution are placed intranasally with bayonet forceps. These are allowed to sit for 5 minutes before the nasopharyngoscope is passed through the nose. For more information, see Nose Anesthesia. The larynx is numbed with topical 4% lidocaine. An assistant passes the flexible laryngoscope through the laryngoscope and positions it above the glottis. The surgeon grasps the patient's tongue with gauze in one hand and inserts a syringe with an Abraham canula with the other hand. While the patient phonates, lidocaine 4% (ie, in 3-4 0.5-mL aliquots) is dripped onto the tongue base, epiglottis, arytenoids, and vocal folds. For skin anesthesia, less than 1 mL of 1% lidocaine is needed to create a wheal in the skin and subcutaneous tissue overlying the injection site. For more information, see Infiltrative Administration of Local Anesthetic Agents. The patient is seated upright in a chair during this procedure and is asked to lean forward slightly, with the chin up. Transcutaneous injection laryngoplasty aims to medialize a patient's vocal fold. The 3 approaches are placement of the needle through the thyrohyoid membrane, through the thyroid cartilage, or through the cricothyroid membrane. 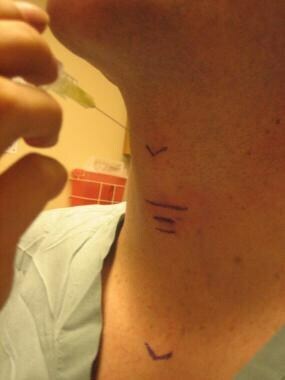 Prior to performing the procedure, the hyoid bone, thyroid cartilage, and cricoid cartilage are outlined in the midline with a skin marker (see image below). In all 3 approaches, the nasal cavity, larynx, and skin are anesthetized as described above. The skin to be anesthetized is specific to each approach. After the skin is numb, the nasopharyngoscope is passed transnasally and suspended above the larynx by an assistant. The surgeon then passes the injectate needle through the skin via 1 of the 3 approaches outlines below. The injectate needle is directed toward the posterior vocal fold. For a patient with an immobile or hypomobile vocal fold, the injection is directed lateral to the vocal process. The goal of this injection is to rotate the arytenoid medially and medialize the true vocal fold. A second injection, if necessary, is placed more anterior at the midportion of the vocal fold. A syringe filled with augmentation material with a 25-gauge needle is passed superior to the thyroid notch through the skin, subcutaneous tissue, and preepiglottic space, superior to the vocal folds, into the airway. See image below. Once the needle enters the airway, it can be visualized with the nasopharyngoscope and is directed laterally into the vocal fold. Augmentation material is placed within the paraglottic space under direct visualization. This approach is better used in younger patients before the thyroid cartilage has ossified. In this approach, the vocal fold is approached laterally and the needle is passed through the skin and thyroid cartilage and then into the vocal fold. The thyroid prominence and lower thyroid cartilage border are marked in the midline with a skin marking pen. The skin overlying this area is anesthetized with 1% lidocaine. A 25-gauge needle, attached to a syringe filled with augmentation material, is passed through the lateral thyroid cartilage into the vocal fold. The position of the needle is visualized on the monitor via the nasopharyngoscope. This approach allows for entry into the airway in the subglottic region in which the needle is passed into the vocal fold from below. The cricothyroid membrane is located inferior to the vocal folds between the thyroid and cricoid cartilages. 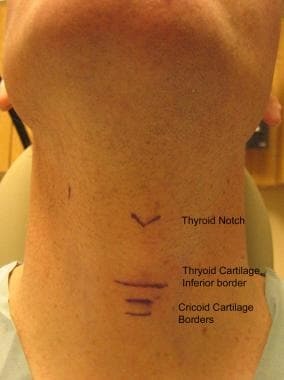 The position of the thyroid and cricoid cartilages is marked on the skin with a skin marking pen. The skin overlying the midline cricothyroid membrane is injected with 1% lidocaine. The fiberoptic laryngoscope is passed through the nose and positioned just above the epiglottis by an assistant. 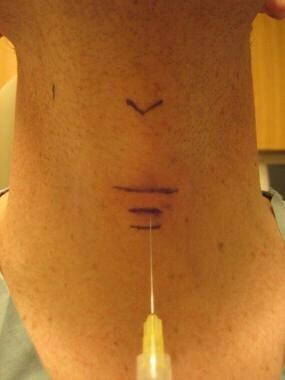 A syringe with a 27-gauge needle is passed in the midline neck through the cricothyroid membrane. See image below. The needle is visualized passing into the airway. The needle is passed underneath the true vocal fold and inserted into the paraglottic space. Always visualize the needle in the correct position before injecting. Do not perform a blind injection. Patients should not eat or drink for at least 1 hour after the procedure to allow the anesthesia to subside. Some products, such as Cymetra, require reconstitution with saline prior to injection. Reconstitution should be performed before the patient is anesthetized, as consistency can vary. As a guideline, approximately 0.6-0.8 mL of material are needed to medialize a male vocal fold. Only 0.4 mL are needed for a female larynx. [2, 7] The end point should be a slightly overcorrected vocal fold that has been placed in the midline. Slight overcorrection is performed to account for some resorption of material. Studies have shown that the distance from the anterior neck skin to the vocal fold is 15.8 mm in males and 13.9 mm in females in the transcricothyroid membrane approach. Since visualization below the vocal folds can sometimes be difficult, this serves as a guide to help confirm that the needle is in the vocal fold. Some patients have allergic reactions to injected compounds. Physicians should monitor for this and be aware of this potential complication. Patients can become short of breath after injection. The physician should be careful not to overinject the vocal fold too much. Augmentation material can be misplaced in the vocal folds and extrude after injection to the incorrect compartments. This is treated by observation or direct microlaryngoscopy with removal. Many of the products used in vocal fold augmentation are not approved for laryngeal injection by the US Food and Drug Administration (FDA); only Radiesse Voice and Radiesse Voice Gel are FDA-approved for injection laryngoplasty. Patients should be made aware that use of these other products for laryngeal injection is considered an off-label application. Sielska-Badurek EM, Sobol M, Jędra K, Rzepakowska A, Osuch-Wójcikiewicz E, Niemczyk K. Injection laryngoplasty as miniinvasive office-based surgery in patients with unilateral vocal fold paralysis - voice quality outcomes. Wideochir Inne Tech Maloinwazyjne. 2017 Sep. 12 (3):277-284. [Medline]. [Full Text]. Courey MS. Homologous collagen substances for vocal fold augmentation. Laryngoscope. 2001 May. 111(5):747-58. [Medline]. Hamdan AL, Rizk M, Ayoub C, Ziade G. Injection laryngoplasty through a transoral approach using the Guedel oral airway. Acta Otorhinolaryngol Ital. 2017 Oct. 37 (5):444-446. [Medline]. [Full Text]. Achkar J, Song P, Andrus J, Franco R Jr. Double-bend needle modification for transthyrohyoid vocal fold injection. Laryngoscope. 2012 Apr. 122 (4):865-7. [Medline]. [Full Text]. Amin MR. Thyrohyoid approach for vocal fold augmentation. Ann Otol Rhinol Laryngol. 2006 Sep. 115(9):699-702. [Medline]. Flint PW and Cummings CW. Medialization Thyroplasty. CW Cummings, BH Haughey, JR Thomas, LA Harker, PW Flint. Cummings Otolaryngology: Head and Neck Surgery. 4th. Philadelphia, PA: Elsevier Mosby; 2005. 2187-98. Mau T, Courey MS. Influence of gender and injection site on vocal fold augmentation. Otolaryngol Head Neck Surg. 2008 Feb. 138(2):221-5. [Medline]. Jin SM, Park CY, Lee JK, Ban JH, Lee SH, Lee KC. Transcutaneous injection laryngoplasty through the cricothyroid space in the sitting position: anatomical information and technique. Eur Arch Otorhinolaryngol. 2008 Mar. 265(3):313-9. [Medline]. Sanderson JD, Simpson CB. Laryngeal complications after lipoinjection for vocal fold augmentation. Laryngoscope. 2009 Aug. 119(8):1652-7. [Medline]. Courey MS. Injection laryngoplasty. Otolaryngol Clin North Am. 2004 Feb. 37(1):121-38. [Medline]. O'Leary MA, Grillone GA. Injection laryngoplasty. Otolaryngol Clin North Am. 2006 Feb. 39(1):43-54. [Medline].